We were on a family holiday in Scotland for Jeroen’s (my husband) 40th birthday. Erin and her older sister Caitlyn had both had a sickness bug before we left. Caitlyn was fine after 24 hours but Erin seemed to be struggling to shake it off. She was not being sick but had no appetite and was looking a little pale. We thought she would pick up and drove to Fort William in Scotland. While we were away Erin seemed to get more and more pale and still no appetite. She still seemed energetic and playful which was surprising considering she wasn’t eating. The day before we were due to leave she looked terrible, very very pale and going blue around the mouth. We decided to take her to the little local hospital for them to check her over before driving home the following day. The doctors there heard a heart murmur and decided to transfer her to Inverness for them check it over properly. Once in Inverness, they did some blood tests which came back showing she had leukaemia. I have never felt so alone and scared in all my life. I was miles away from home and my husband and older daughter were an hour and a half’s drive away in Fort William. Erin’s blood results showed she was extremely anaemic and needed an emergency blood transfusion. She was then transferred to York Hill Children’s Hospital in Glasgow, and from there we were transferred by air ambulance to The Royal Marsden in Sutton, Surrey. Erin was considered too ill to be transported by road. Jeroen had to do the drive back on his own as I was with Erin and my mum had flown up to Glasgow to be with us and she took Caitlyn back with her. 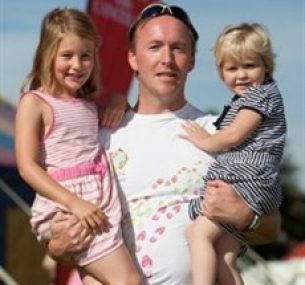 Once at the Marsden, Erin was diagnosed with acute lymphoblastic leukaemia and commenced treatment on 5 August 2010 on regimen A. However when her initial bone marrow results came back, they showed that she had the MLL gene, associated with lower survival, and she was moved on to regimen C. We were so scared and being thrown into the complete unknown. As a parent your natural instinct is to be there for your child and protect them, I felt so completely useless as the care of my child was completely out of my hands. I had to completely trust the people around me to look after my little girl. Erin was just 15 months old when she was diagnosed but was so brave and so good for all the doctors and nurses. My older daughter Caitlyn had just turned four. She too was amazing; her holiday ended in disaster and mummy and daddy were not there for her, she had been with my mum and sister. However she did not moan or play up at all. She was amazing and tried so hard to understand what was happening to her little sister and was never once jealous of the attention her sister was getting and how she wasn’t getting any. After three weeks, we left the Marsden to go home which again was very scary for us. You go from having the doctors and support around you to going home where you are on your own. I was very nervous about leaving but also glad to be going home so I could see Caitlyn too. After the first four weeks of treatment Erin had gone into remission successfully which was a massive relief as it meant we didn’t have to have a bone marrow transplant which was great news. The first year of treatment was very difficult. Erin was very ill from the treatment and we spent a lot of time in hospital. 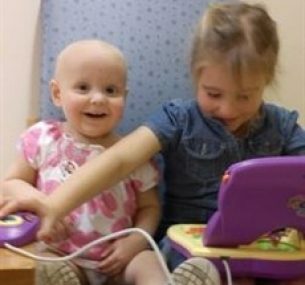 The regimen C treatment protocol is very tough and Erin received a lot more chemo than most leukaemia patients. Caitlyn started school in the September after Erin was diagnosed in the August and I just managed to take her to school on her first day, after a friend offered to sit with Erin so I could take her. Caitlyn was so good in her first year of school, having friends pick her up more often than mummy and daddy but again not complaining about it. Erin is currently doing really well. 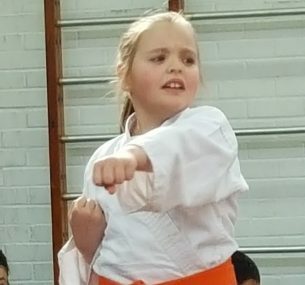 She has started karate and is up to orange belt. She has a problem with her heart function due to all the chemo and is under a cardiology specialist. However it doesn’t stop her from being active and the karate seems to help. She is still on six-monthly check ups with her oncologist consultant. She is very well at the moment and thoroughly enjoyed the day out at Weston-super-Mare. We have had some really great friends and family that we have been able to call on day or night to help us out when needed, especially in helping with Caitlyn and taking care of her. I felt terrible that I was not around very much for Caitlyn but knew she was in safe hands with our fantastic friends looking after her. Erin has finished treatment now and is doing really well. She seems to be getting stronger and more energetic by the day.